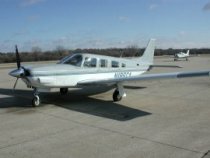 CALMIT operates a Piper Saratoga for airborne remote sensing. The platform currently supports an imaging spectrometer (AISA-Eagle), an imaging fluorometer (IBIS), and a thermal imager (Jenoptik IR Camera). 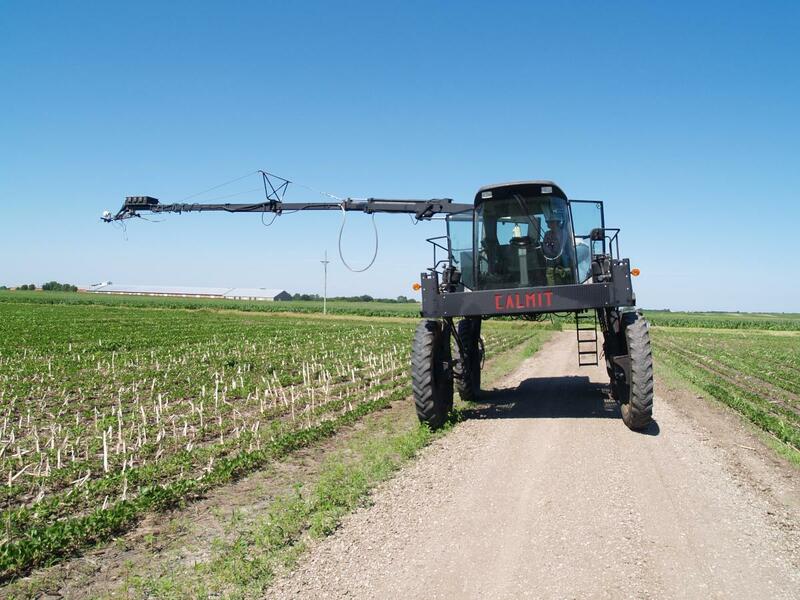 CALMIT operates a unique, versatile all-terrain instrument platform (“Hercules”) for collecting spectral data in agricultural fields. Hercules provides a high-clearance vehicle for measuring plant optical and thermal properties in field settings. The instrument package can be raised to a height of approximately 50 feet above the ground surface, and rotated through a full circle around the platform. The maximum sensor payload for the boom, at full extension, is ~60 pounds. 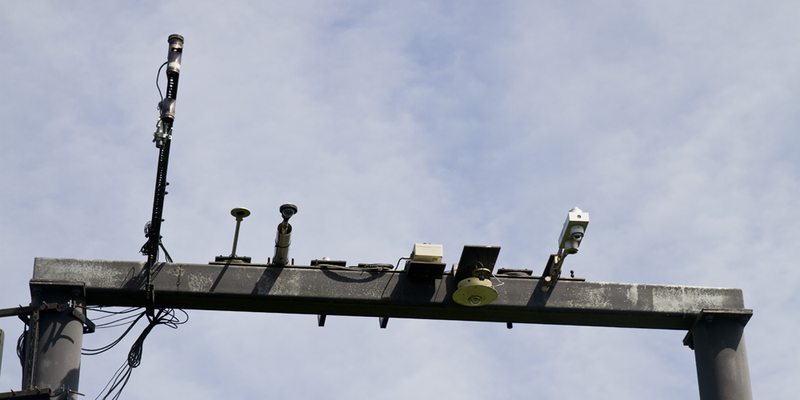 The operator has complete control of the sensor position from the deck. 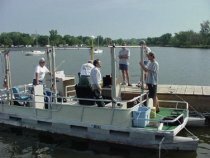 CALMIT operates a 24-foot pontoon boat, which has been specially modified for collection of spectral data above, at, and beneath the surface. The boat provides an excellent workspace for data collection on lakes and reservoirs. 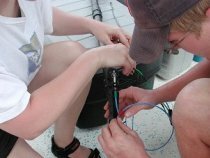 In addition to equipment for monitoring radiation fluxes, the boat carries a GPs receiver, onboard computing, and portable water-quality and analysis equipment. 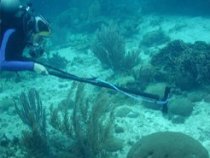 Researchers often operate our numerous pyranometer, terrestrial-quantum, and underwater-quantum sensors when collecting spectroradiometer data in the field. In the case of the underwater sensors, upwelling and downwelling PAR are typically measured at two different depths, as a means of calculating the rate of extinction of light in lakes and reservoirs. The boat can be safely towed over long distances to facilitate study of distant aquatic systems. Water samples are typically collected and analyzed in support of our remote-sensing research on lakes and reservoirs. Detailed analyses of plant pigments, specific cations and anions, and other parameters are available through our own facilities, those of our research partners, and other university collaborators. CALMIT owns portable analysis equipment including instrumentation for measuring conductivity, turbidity, alkalinity, and other physicochemical parameters. A portable laboratory, with a spectrometer and reagent chemicals, provides additional measurement capabilities. With the portable and lab-based instrumentation, we are able to make measurements on-site, on a same-day basis, at remote locations and/or in a clinical-laboratory setting. This affords repeatable water sampling linked directly to remotely sensed data either from our spectroradiometers or in conjunction with aircraft/satellite overpasses. CALMIT maintains several data servers, and a powerful computational facility for high-speed image processing (256 CPUs and 16,000 GPU cores processing cluster). The first Analytical Spectral Device (ASD) FieldSpec FR system, purchased in early 1998, provides hyperspectral coverage from 350 to 2500 nm. 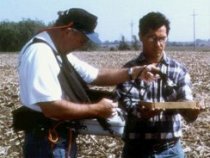 The additional capability in the mid-infrared spectrum is important with regard to staff research involving agricultural vegetation. The system was configured to allow positioning both on the boom of the Goliath vehicle and by one individual carrying it on foot into the field. The ASD can be used for assessing vegetation at both canopy and leaf levels (with optional leaf clip). A second ASD-FR was acquired in 1000. In 2001, CALMIT purchased a UniSpec radiometer capable of collecting data in 256 channels ranging from 300 to 1100 nm. The UniSpec provides us with capability for not only assessing water quality but also vegetation at leaf-level.